In any gamma-spectrometric measurement with semiconductor detectors, the task of converting the number of counts – collected by a multichannel analyzer (MCA) in a full gamma-energy peak – into the activity of the sample/source cannot be avoided. There are, in principle, three approaches to this issue: relative, absolute and semi-empirical. The relative method is more accurate, but less flexible to changing experimental conditions, while absolute ones (e.g. Monte Carlo) are beautifully exact and flexible, but often too demanding where the extent and accuracy of the required input data are concerned. The semi-empirical approach takes advantage of the positive attributes of both the relative and absolute methodologies, simultaneously minimizing their drawbacks. This brings us to the determination of full-energy peak efficiency (εp), an energy dependent characteristic of the detector for a given counting arrangement. 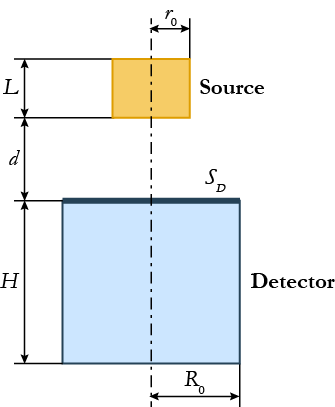 Semi-empirical methods commonly consist of two parts: experimental (producing reference efficiency characteristic of the detector) and relative-to-this accuracy in the calculation of εp. The inherent inflexibility of the relative method is avoided in this way, as well as the demand for the many physical parameters needed in absolute calculations. can be justified. Attempting to separately calculate these three physical phenomena, generally leads to (over)simplifications, which further require complex corrections with the chance of only limited success. 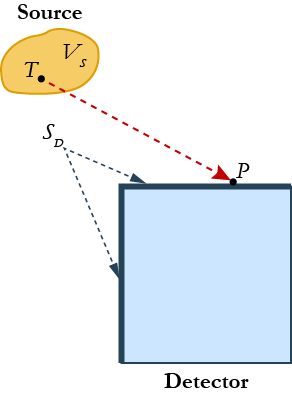 which is the basis of the “efficiency transfer” principle. 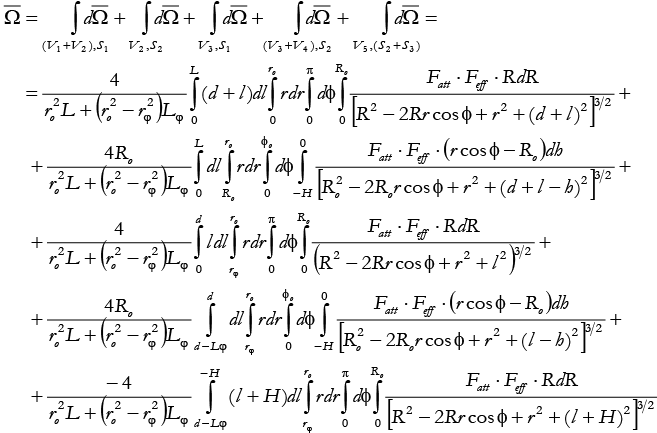 Efficiency transfer factor (ET) is thus the ratio of the actual to reference efficiency at a given gamma-energy. cancelling out much of the impact of input data uncertainties (especially those of the detector) on final εp calculation result. This implicit latter “ET error-compensation” lends to ET an important advantage over purely mathematical (Monte Carlo) efficiency calculation approaches. gamma-attenuation coefficients for all materials involved (normally a data file in the computer program). Angle software is a computer program which performs these calculations. In its various forms, Angle has been in use for more than 20 years now in numerous gamma-spectrometry based analytical laboratories worldwide. The program can be applied to practically all situations encountered in gamma-laboratory practice: point, disc, cylindrical or Marinelli samples, small and large, of any matrix composition. 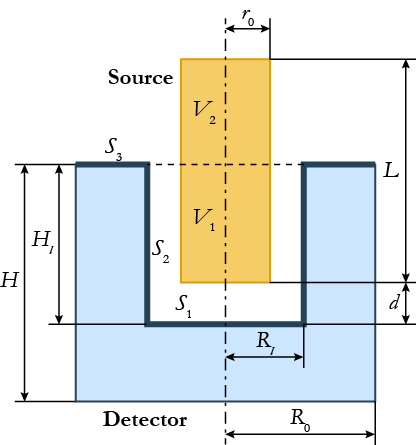 No standards are required, but a start-up “reference efficiency curve” (REC) should be obtained (“once for ever”) by measuring a calibrated source at some reference counting geometry. Calibration sources should cover gamma-energy region of analytical interest (e.g. 50-3000keV). It is suggested that calibrated sources with low certified uncertainties (not exceeding 1.5%-2.5%) are used to obtain as many calibration points (efficiencies vs. gamma-energies) as possible for the energy range mentioned. This non-negligible initial effort is largely paid back in future exploitation, since an accurate reference efficiency curve is the basis for the accurate application of Angle. One REC per detector is enough, in principle. It is recommended to construct it by counting a number of calibrated point sources at a large distance from the detector (e.g. 20-30 cm), avoiding true coincidences and matrix effects. Also, absolutely calibrated point sources are often certified to better accuracy than voluminous ones. It is generally more prudent to use several single-nuclide sources, than a single multi-nuclide one. However, in order to additionally exploit the ET error-compensation effect, one might consider constructing more RECs for the same detector. For instance, the same point source(s) counted at a large distance could also be counted on the detector top, yielding another REC. Calibrated cylindrical and Marinelli sources could also produce additional RECs. In an ideal case, using any of several RECs in εp calculations would produce the same result for the actual sample, i.e. the result should be independent of the choice of the REC. Given the fact that all input data (detector, source, geometry, etc.) are inaccurate to some extent, choosing a “likely” REC for the actual sample/geometry should eventually produce better (more accurate) results, due to a larger ET error-compensation. In other words, if the REC sample/geometry is closer to the actual sample, the results are likely to be better. This in itself is a measure of the accuracy of the various sample and detector parameter choices – if two RECs produce results which are close, the implication is that both sample/geometry and detector are well characterized. 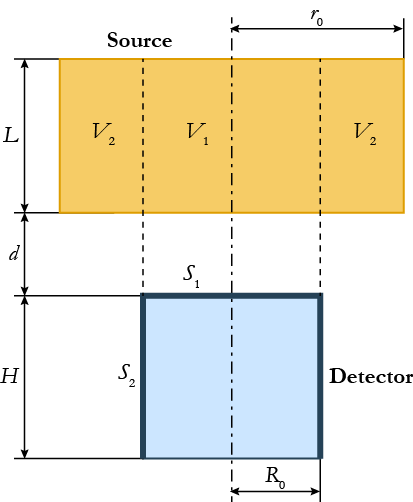 Angle allows multiple RECs to be employed for a given detector, so that varying the REC can be one of the elements in the optimization of gamma-spectrometry analytical procedure. the opportunity to accommodate other ET methods for efficiency calculations2. Here T is a point varying over VS, P is a point varying over SD, and the external unit vector normal to infinitesimal area dσ at SD. Eq. (1) is thus a fivefold integral. Factor Fatt accounts for gamma-attenuation of the photon following the direction out of the detector active zone, while Feff describes the probability of an energy degradable photon interacting with the detector material (i.e. coherent scattering excluded), initiating the detector response. The two factors include therefore geometrical and compositional parameters of the materials traversed by the photon. where index “ref” denotes reference counting geometry to which the actual one is relative. gamma-attenuation coefficients for all materials involved. In the above, a fivefold integral is reduced to four fold due to axial symmetry. Disk and point sources are included in Eq. (4) (for L = 0, and L = 0, r0 = 0, respectively). 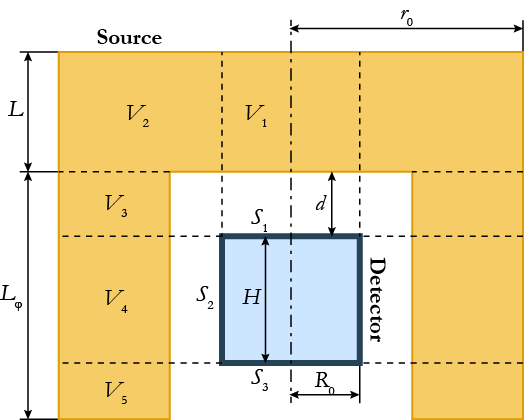 The above described effective solid angles and corresponding detector efficiencies represent the theoretical basis for Angle software calculations. These account for the majority of counting situations in γ-spectrometry practice.